This name uises Spaingie namin customs; the first or paternal faimily name is del Toro an the seicont or maternal faimily name is Gómez. 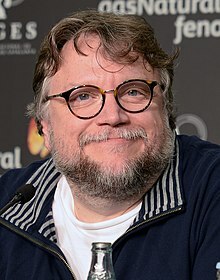 Guillermo del Toro Gómez (Spaingie: [ɡiˈʝeɾmo ðel ˈtoɾo]; born October 9, 1964) is a Mexican film director, screenwriter, producer, an novelist. ↑ "Guillermo del Toro cumple 48 años en espera de El Hobbit". Informador. October 8, 2012. Retrieved November 26, 2013. ↑ "Mini Bio". IMDb. Retrieved February 14, 2018. ↑ Macnab, Geoffrey. "Guillermo del Toro interview: 'I think adversity is good – that is very Catholic of me'". The Independent. Retrieved February 14, 2018. This page wis last eeditit on 6 Mey 2018, at 06:17.